Multiple IP addresses from one host name. 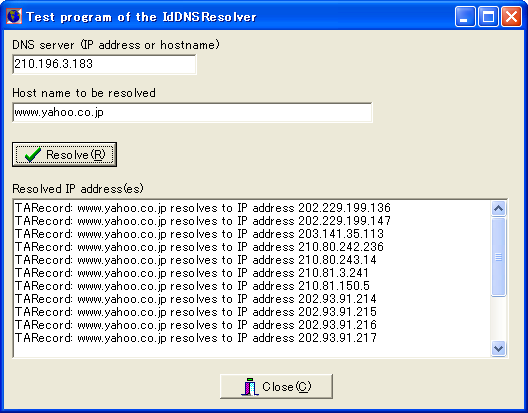 How to obtain multiple IP addresses from one host name by using the IdDNSResolver. Copyright (C) 2005 Fumio Kawamata. Created on November 3, 2005. Last modified on December 29, 2005. I can obtain one IP address from one hostname as below. Some host returns multiple IP addresses as below. I did not know how I can obtain multiple IP addresses from one hostname. So, I asked at the atozedsoftware.indy.general newsgroup, news.atozedsoftware.com, and I could get the answer how to do that. I have prepared this web page for the person who do not know how to do that yet. I hope this web page will help someone.